For some people halibut is the fish you always order at a restaurant, but perhaps shy from in your own kitchen. However, this species and cut of fish is so packed with nutrients and loaded with flavor, so once you know how to prepare it, your at-home seafood game will exist on a whole other level. What Makes a Halibut Steak Unique? Before we dive into recipes, here’s a little basic fish vocabulary: a fish fillet is a cut of fish where the flesh has been sliced away from the bone. A fish steak is cut perpendicular to the bone, and often includes that bone along with the fish flesh. Steaks are often thicker cuts of fish, and therefore require different cooking techniques and recipes compared with thinner fish fillets. So, what makes a halibut steak such a spectacular cut of fish? 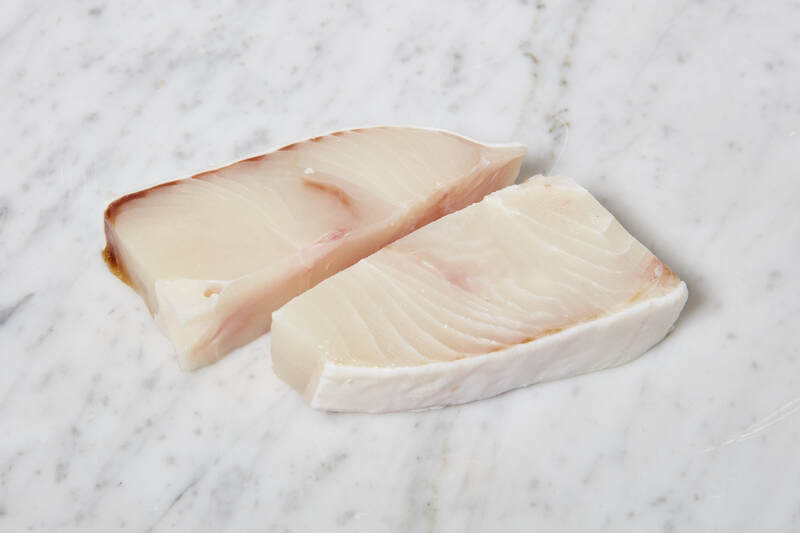 Similar to how a bone-in rib eye steak is packed with flavor thanks to the presence of the bone, a halibut steak is also extra flavorful for the same reason. And because this mild white fish is so versatile, it can be prepared in a wide variety of ways, from broiled and baked, to grilled, pan-fried or poached. One important thing to keep in mind is that halibut has very low oil content. As such, it will dry out faster if it is overcooked, so you need to pay close attention to recommended cooking times and keep an eye on the texture of your skin’s flesh as it cooks. There are so many options and so many simple ways to cook a halibut steak that you can’t really go wrong. Here are 7 ways to work with halibut steaks, all of which are sure to satisfy your taste buds and elevate your at-home seafood game forever. This baked halibut is a hearty dish but is also incredibly light and seriously healthy. The fish steaks aren’t even seasoned or marinated, so it’s a great quick and easy meal to whip up in just 15 minutes. First you sauté the veggies seasoned simply with salt, pepper, olive oil, garlic and basil. The halibut steaks are then smothered with the prepared veggies and baked for 15 minutes, or until done. You can check the fish by making sure it flakes easily with a fork and it is almost completely opaque in the center. Summer is over but its flavors don’t have to be. This roasted halibut is baked in one pan on top of fresh nectarines, resulting in a slightly sweet but light dish with perfectly cooked fish and tart chutney. It’s as beautiful as it is delicious, and it’s shockingly easy to make. Taco night gets a healthy twist from this pan-seared halibut dish. The halibut steaks are cooked for just 3-4 minutes on each side, and then topped with a refreshing and slightly spicy pico de gallo mixture, and all finished off with fresh lime juice. You can skip the tortillas and eat this fish as it is -- it’s that flavorful and delicious. And did we mention it only has 270 calories per serving? This fried fish dish only takes about 10 minutes to cook (5 minutes on each side) and the breading is simple — just a mix of lemon juice and flour. As far as fried foods goes, it’s about as healthy as you can get, and it’s a great way to serve a halibut steak dish that is crisp on the outside but still tender on the inside. We love anything and everything served with pesto sauce, and this halibut dish is no exception. The recipe calls for homemade pesto but if you’re pressed for time store-bought will do just fine. Season the halibut steaks with salt and pepper and then smother with pesto sauce on both sides before grilling (or baking or sautéing, depending on your mood). It can be hard to beat a perfectly grilled piece of fresh fish, and these grilled halibut steaks are perfect when finished with a flavorful herb vinaigrette. You can serve the fish what whatever accompaniments you love, but this combination of fresh grilled veggies and grilled bread is a perfect blend of healthy and satisfying. Is there anything better than anything smothered in melted butter and garlic? Nope, there is not. This halibut steak dish is seasoned with salt and pepper and cooked until just golden brown, but the real treat is braising the cooked fish in butter, thyme, garlic and capers with extra sauce drizzled on top.